SHOP AMAZON SMILE FOR THE HOLIDAYS – DONATE TO SEARCH! Did you know that you can make a donation to SEARCH just by shopping as you normally would on Amazon? It’s true. Please support us by clicking the AmazonSmile graphic to the left – this will choose SEARCH as your beneficiary and every time you log in to shop, SEARCH wins! Every penny helps us to help others. 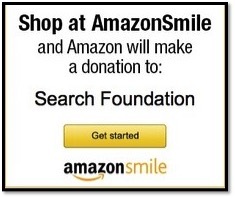 Please consider making your purchases through AmazonSmile to benefit SEARCH.